I put the final tune on the resonators. This took a little while and a lot of miles. Temperature plays a lot in the tune of this instrument. 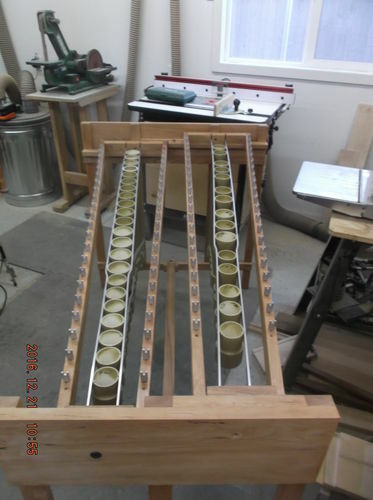 We have had an unusually cool winter I kept the resonators in the house and carried each to the shop sanded a little then walked back in the house checked the tune then repeated. This kept the tube close to room temperature but required about 3 trips per for each resonator time 37 is a lot of trips. Everything is within 3 cents so were good to go. 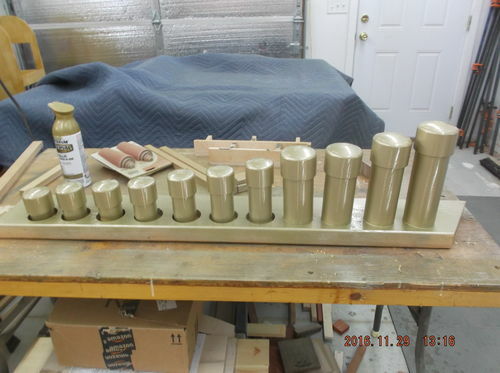 Now I need to paint them went with rattle can gold. This took 3 coats to get good coverage took about a week and couldn’t do anything else in the shop while they were wet. Once painted it was time to lay out and space the pipes. I stood everthing upright inside the frame on my bench. I had 3 tubes left over after the frame was full. Double check all frame measurements everything is good. What is the problem. The caps on the tube have a 1/4” wall thickness making them 1/2” wider than the tube. I had to sand flats on both side of the caps to get down to same diameter as the then everything fits. I was worried this would mess with the tune. The wavelength and tube length control the tune not the outside diameter. I got the spacing set and marked drilled the aluminum strap and tube riveted things together and painted everything again. Time to set them in and finish mounting. 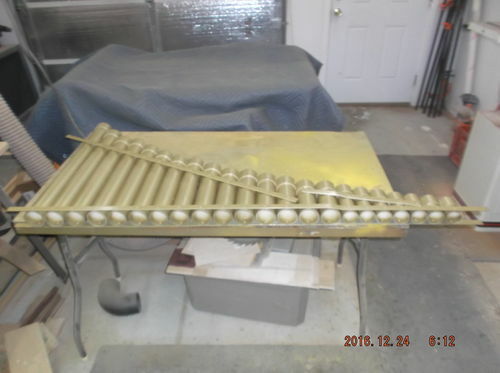 I temporarily suspended some bars over the tubes and it sound like a marimba. What a relief. Now its time to layout, string and suspend the bars. I found the easiest way to string the bars was to heat shrink the end of the line to a crochet hook and pull it thru. One everything is suspended there is a small spring tied to the ends of the line to keep a little tension on the cord. 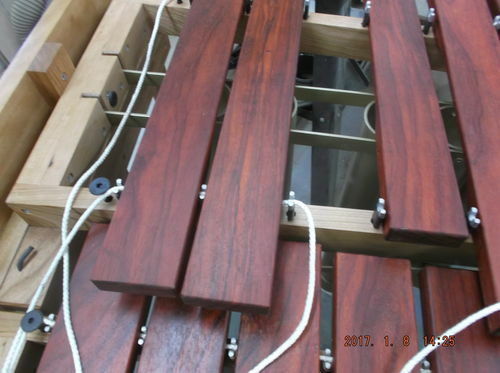 This also enables you to remove the cord from the end screws and roll up that set of bar when taking the marimba apart. 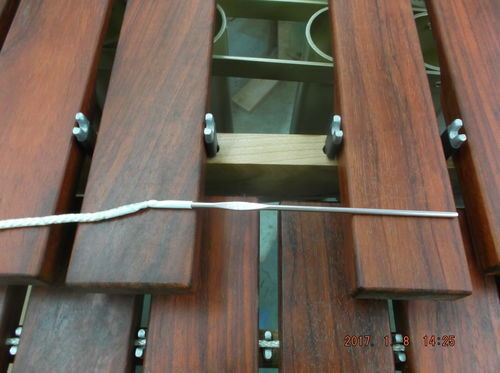 You don’t have to continually unstring and restring the bars when moving. 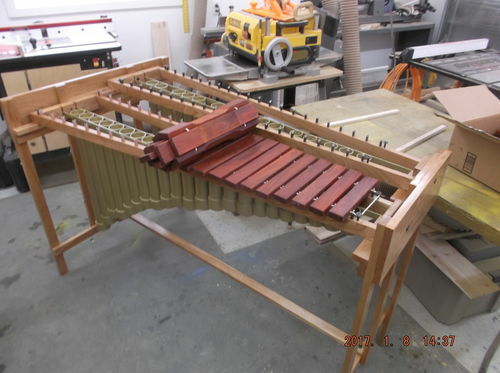 With that the marimba is complete! To my ear it sound pretty good and the electronic tuner says it is in tune. Once this go to the Artistry in Wood Show it will get delivered to the end user and I will try to get my daughter to take some video of it being played. What did I learn from this and would I do it again? Yes I would do it again but only for a family member. I now know why the price tag is so high on commercial instruments and they earn every bit of it. The makeamarimba.com plans are good comprehensive plans. You do need to read them several times and pay particular attention to metric to US conversions. 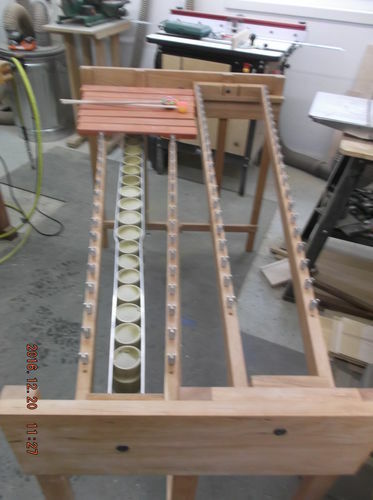 I would purchase his plans for a larger instrument should I weaken and agree to build another. Padauk is a good and reasonable price substitute for rosewood. 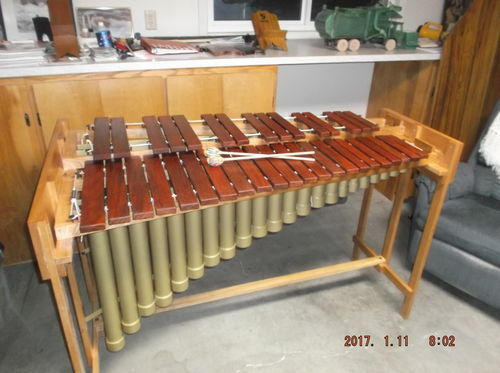 I would probably go with aluminum pipe for the resonators instead of PVC. I initially priced alum tubing and found it very expensive. I found out later that aluminum tubing is structural and that aluminum pipe can be found in the same wall thickness and because it is nonstructural it is much cheaper and would cost much more than the plastic. Aluminum would have prevented the problem I had with the cap thickness and I could have polished the aluminum and it would look better than the gold painted plastic. I am happy with the way the instrument sound and looks and it will make a good practice instrument. Should my grandson want to take this onto a higher level that is several years down the road. And that garbage truck in the back ground doesn’t look to bad either. You did a great job documenting the process Bruce. Thanks!!! Magnificent Bruce, do you have a video of it being played please, love to hear it….